While he is by no means a great actor, Zo In-sung’s acting has improved tremendously since his sitcom days. But the actor’s voice is one of his glaring weaknesses, and a weak voice is a significant disadvantage in period pieces. This is why I expected Zo, cast in the lead as Gen. Yang Man-chun, to be the downfall of “The Great Battle,” which depicts the Goguryeo Kingdom’s fight against the powerful Chinese empire of Tang. To my surprise, director Kim Kwang-sik did a clever job of masking his actors’ weak points and making the most of their strengths in this action-packed flick. 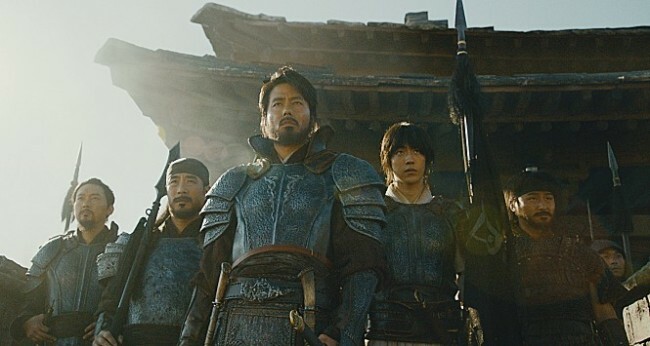 The movie kicks off with a grand battle between Goguryeo and Tang, led by Yeon Gaesomun (Yoo Oh-seong) on the Goguryeo side and Emperor Taizong (Park Sung-woong) on the Tang side. After a devastating defeat, Yeon retreats to the capital of Pyongyang for the final siege, leaving nothing between the 200,000-strong army of Tang and the fortress town of Ansiseong. Yeon, who considers Yang a traitor for not falling in line with his military coup, sends Sa-mul -- a young officer from Ansiseong played by Nam Joo-hyuk -- to the fortress to assassinate Yang. Sa-mul also holds a grudge against Yang for not sending his troops to the battle that killed his best friend. Meanwhile, Ansiseong is in peril with Taizong’s army at its doorstep. When it comes to acting, the cast is far from flawless. Zo’s voice still seems out of place in a period piece, and his big speech prior to the first battle is just uninspiring. But his character refrains from making any more big speeches, taking action instead. Taking liberty with the historical facts -- easy, given that there are very few records left from Goguryeo -- director Kim reimagines the battle and creates an almost fantasylike siege. It is very unlikely that Yang was in his mid-30s, or that there was a squad of beautiful women shooting blowguns, or a group of borderline super-soldiers fighting without their helmets, but this movie throws historical accuracy out the window and the result is a lot of fun. The battle scenes play out like clips from a fantasy or superhero movie, and are done quite well -- except for the occasional much-too-slow slow-motion segments. With a gigantic budget on its side, the movie seems determined to make the battle scenes as epic as possible, which works for the most part. Of course, the budget and technology are not quite on a par with those of Hollywood blockbusters and the computer-graphics soldiers are a little awkward, but the director manages to create the illusion that the 200,000 soldiers are really there. To Zo’s credit, he looks and acts the part and his action sequences stand out. Kim Seol-hyeon, an idol singer and actor, has surprisingly strong moments despite her lack of experience. Her acting range is still quite small, but the director manages to work within that range with good results. Nam, despite his youth and lack of experience, delivers a rock-solid portrayal of a wavering youth who is unsure of what is right or wrong. Does the film have its flaws? Of course. The character-building moments to establish Yang as a people-first leader are almost painfully obvious, and the film has some genuinely cheesy moments. The overflowing of national pride may pump up the adrenaline for Koreans, but may be uncomfortable for foreigners, particularly Chinese -- who will already be annoyed by Park’s weird Chinese accent. It is by no means a masterpiece, but it is an enjoyable film with clear selling points -- maybe enough to crack the 10 million ticket mark at the Korean box office. “The Great Battle” hits local theaters Sept.19.